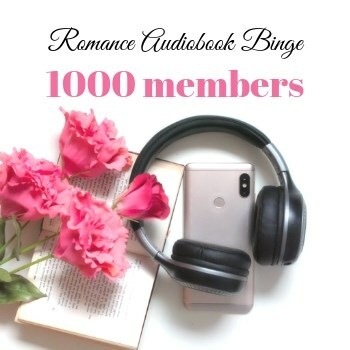 Romance Audiobook Binge now has over 600 members! It’s hard to believe! Our little Facebook group isn’t even that little anymore. I’m very pleased to share an interview with the wonderful Effie Kammenou with you today. I’ve introduced the first two parts of this great series in the last two weeks (Evanthia’s Gift and Waiting for Aegina). Today is the grand finale with part 3: Chasing Petalouthes. And we’ll get more personal with the author, Effie Kammenou. That is not an easy question to answer. The short answer would be 2012, about six months after my mother passed away. I wrote as an outlet to express myself and to channel my grief. But I had been writing a food blog for several years before that. In that blog, I not only shared recipes, but also the traditions and celebrations that went along with the foods. I also occasionally contributed to a regional magazine, writing restaurant and book reviews and feature articles. However, if I go back even further, I remember writing a play with a friend when we were barely in our teens. And to think I thought I was only interested in acting out the plays, not writing them! What is your favourite reading genre? I love to read women’s fiction and contemporary romance with deeper themes. The occasional rom com is fun too. I also like a good paranormal fiction. And I really enjoy revisiting the classics I grew up with. That doesn’t really answer your question, does it? I can’t pin it down to just one. You have had an acting career in the past. How has acting influenced or supported your writing career? My training did, however, influence the way in which I write and develop characters. The way I’d breathe life into a role by giving the character a history beyond the script is the same way I gave my characters in my books their personalities, traits and pasts. How has your Greek heritage influenced the stories you write? My Greek heritage is all over these books – the traditions, customs and religious holidays. The food and the spirit of the Greek people. The stories I’ve heard all my life and the experiences I’ve had. My observations of other Greeks and Greek-Americans and the dynamics of their families. All of these factors influenced my stories. Chasing Petalouthes is the third and last book in The Gift Saga. This story focuses on the current generation in the family as they navigate their way from adolescence to adulthood. In the other two books the mains characters are women and it’s no different in this one. Evvie has lived through the loss of her father and her most beloved yiayiá. Because of this, she thinks that closing her heart will protect her from future pain. She’s wilful and defiant at times in respect to her mother who has her best interest at heart but sometimes tries to force her hand in a direction that doesn’t interest her. Stella is the youngest of a family of siblings and cousins who, in her mind, are all more attractive, intelligent and talented than she is. She suffers from a lack of self-esteem and that frame of mind lands her in a relationship with the wrong man. Throughout the story, the younger generation learn lessons from the older members of their family. Many of the chapters drift back in time as far as 1928 before any of the family had come to America. In the end, the entire saga is tied together in a very meaningful and heartfelt manner. Where do you write and do you have a writing routine? I have a home office connected to the kitchen. The joke in my family is that I only occupy one of two spaces in the house – the kitchen or the computer chair. I work during the day, so I write in the evenings and on my day off. I’m a night owl. I sometimes can be found at the computer until 2 AM and then I get up to go to work in the morning. I can be a little obsessive once I’m in a writing zone. I hate to be interrupted and writing that late affords me a lot of quiet time. What steps do you take to ensure your writing is ready for release? I make quite a few revisions before anyone else lays eyes on it. I have a good friend, who I call my unofficial editor, and she is the first one to read through the manuscript. I take her suggestions and do another revision. With the first book, I had several beta readers and I’d made many changes after their read through. With this last book, I only had two beta readers before I handed it over to my editor. I make a few more revisions while working with her and when the manuscript is where we both want it to be, it goes out for a final proofread. What is your favourite go-to snack when writing? That all depends. Sometimes it’s dark chocolate and other times, chocolate licorice. But I’m really more of a savory food lover. Give me a few chunks of cheese and I’m a happy person. Especially kasseri! I know you are fond of cooking. Tell me a bit about your food blog and how your cooking has influenced this. The food blog was started because people were always asking for my recipes. I thought it was an easy way to share them and also give a little backstory on what makes the dish I’m sharing special. Most of the recipes are family ones, taught to me by my mother and yiayiá. I’m proud of my Greek heritage and I enjoy explaining the customs and traditions that go along with our delicious foods. I also have other recipes, ones I’ve developed myself and aren’t necessarily Greek. I entertain a lot, especially in the summer, so I post those recipes as well. All three of the books contain recipes between some of the chapters. I did this for a couple of reasons. I simply couldn’t help myself! But I also thought for the non-Greek readers, the list of ingredients would aid in imagining what the foods in the text might taste like. What’s on your current to-do list right now? 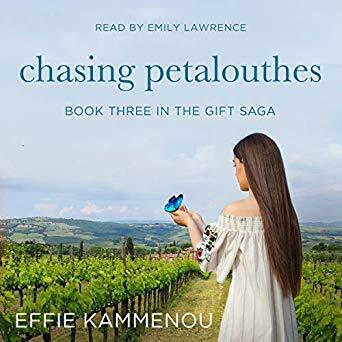 Chasing Petalouthes was released on June 3, 2018. I’m busy marketing the completed series and I’m working with my cover designer and formatter to create a box set so it can be purchased together at a discounted rate. I also have notes on the next series and plan to begin writing in a month or so. I also need to build an author website, something I’ve put off. I’ll be working on that as well. It’s gotten a lot colder in the last couple of days and I’m ready to get into a seasonal spirit. And what better way to do that than by giving away something I love to people who will love it just as much as I do! 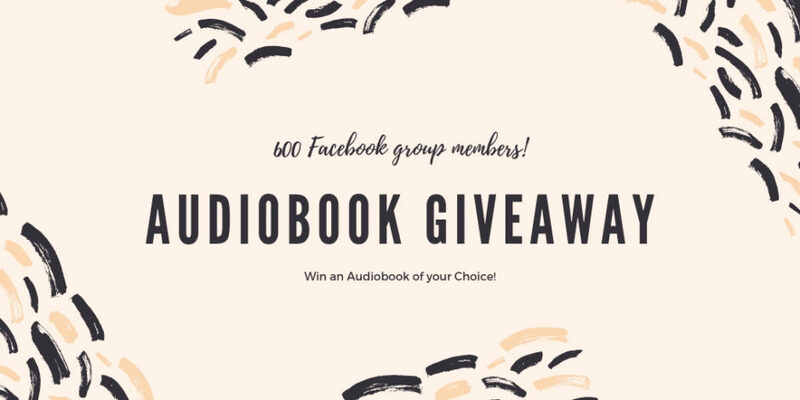 And since we’re on Lovely Audiobooks I, of course, want to give you an audiobook of your choice! 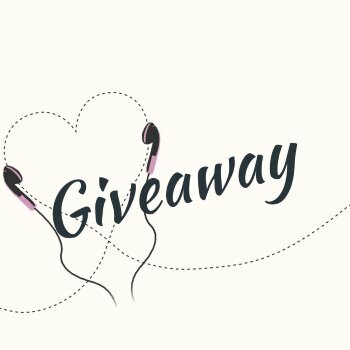 Enter to win 1 Audible.com credit that you can use for any audiobook you want! You don’t know what the Romance Package is? Click here and read my guide to cheap audiobook subscriptions that let you binge on a budget. Did you read my article on why I love audiobooks so much? Click here.